I kicked off the Oscar season yesterday by seeing Happy-Go-Lucky at the Avon. As part of the lead up to their Oscar gala, the Avon shows many of the more obscure Oscar-nominated films. That's how I got to see the captivating, Sean Penn-directed, Into the Wild last year. HGL was cute but not as captivating- it should have been 20 minutes shorter. Go to the Avon's site for full film schedule. 2. A documentary about New Orleans called Trouble the Water- that's on Sat, Feb. 21, at 11:00am. 3. I reeeeeeeeeeally want to go to the Oscar Gala, where you dress up and watch the Oscars on the Avon's Big Screen, but that's $350 a person. Forget it; that's over 1/3 the price of the $900 stroller I've been coveting since my trip to giggle in Greenwich. MUST- HAVE- BUGABOO. 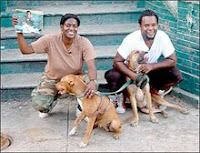 Beginning the day before Hurricane Katrina made landfall, Kimberly Rivers Roberts, an aspiring rap artist, turned her new video camera on herself and her 9th Ward neighbors trapped in the city. Along with her husband Scott, Roberts continued to film their harrowing retreat to higher ground, the dramatic rescues of friends and neighbors, the devastation of their neighborhood, and the appalling repeated failures of government. Back to the stroller. I get obsessed with things. Right now it's the Bugaboo Cameleon stroller. I know that's a lot for a stroller, but you don't understand how smoothly and lightly it steers. Previously, I was obsessed with the glass bracelets at Artistic Hand-Blown Glass downtown. I am currently obsessed with Biggest Loser. Before that, it was Lost and Guitar Hero. I have been obsessed with the color orange since my wedding. I had orange roses, and right now, there is orange striped bedding on the baby's crib. This website actually has the same colors as my wedding- orange and light blue. Oh, and the bugaboo? You can get part of the fabric in orange. You see why I cannot shake the bugaboo. I understand that it might seem grossly materialistic, but I say to you, you have not pushed the bugaboo. Husband, just now: "You realize it's just a carriage, right?" Silly, silly man. He was the one who initially acted like we might buy it, so I blame him for putting the bugaboo in my head. I was just gonna go Graco. Now, visions of bugaboo dance in my head. --JANUARY 6, 2009-- Biggest Loser Season Starts Tonight! Craigslist, girlie. Make your expensive stroller dreams come true courtesy of craigslist. I second craigslist! Check it out - Greenwich mommies might be giving them away. I too wanted the bugaboo... but the Graco has done the job! A stroller costs $900 ??? Giggle also has one that costs $1200- the odd-looking Stokke! Thanks for the craigslist tip! I did find a bugaboo Frog for $400- will show it to the husband! However colors are black and tan- BORING! Hmmm I suppose I could buy a new color cover for it... but that's $100. For $500 I might as well get a brand new damn Cameleon. Also my Mom and dad offered to chip in a couple hundred bucks... do you see the slippery bugaboo slope I am dealing with? So. Assuming you use the bug for two children for three years each, it's only like $2.50 a day. See? Cheap! This works beautifully for shoes and bags too. b) the Bob jogger is currently 20% off at giggle, making it closer to 300 than 400. So I kind of feel like if I don't get bugaboo, I can get justify the pricey jogger that also rolls really smoothly... because I am SURE this new baby is going to cut into my gym time! I might be forced to walk/jog to get my cardio. I have a snap and go frame I can use with the car seat until you know, 5-6 months... so... it might be bye bye bugaboo. 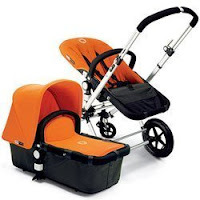 Plus I think the bugaboo only goes to 40 something pounds, and the Maclaren goes to 55. I cannot believe I am discussing strollers! I totally did not even understand strollers until about a month ago. I share your fondness for orange. I have an orange, cream and gray Peg Perego you can have once the baby is about 6 mos. I also have no fewer than ten giant garbage bags full of high-end clothes for boy or girl. Want some stuff? No way! Really? Nineybear, email me at stamfordtalk at gmail and we will TALK!!! Yeah- when I visited the bugaboo Monday at giggle, I was struck by how absurdly complicated the fold was. I think I am abandoning the bugaboo obsession in favor of a Bob jogger obsession. I'm now spamming my husband with Bob reviews and reminders that it's 20% off at giggle. Wonder if that means a new version is soon to come out? We have a Bob Revolution (in orange!) and it's outstanding. LOVE it. I bought it with the intention of actually jogging with it, but we use it mostly for walks around the neighborhood. The shocks are great for the bumps. Definitely go for the Bob. We also have a Maclaren for everyday (a Quest), which is so easy to fold and toss in the back of the car. Very sturdy, and the fabrics are great. We once had to replace the hood on the model we have, and it was so easy to do on their Web site. Love their customer service. You are very much passionate about color orange. As you are currently obsessed with strollers. We bring in the brand new Hauck speed sun which is also available in orange color ,it has got best features that available in the market.